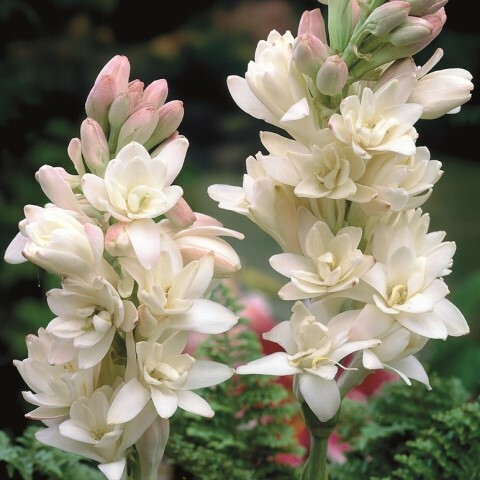 Tipped as the most fragrant bulb in the world, the aptly names Polianthese The Pearl's double blooms smotherthe tipsof each stem throughout summer and release the most intense floral scent. Its intoxication fragrance is often used as a base scent for high-end perfume. Prefers well-drained sol in sun. Additional Information - Keep the soil consistently moist throughout active growth as this will aid in the plants overall health and development. After the flowering period, bulbs should be dug up or transplanted and stored over the winter period. This will protect them from frost damage. Continue to water Polianthes, taking care not to waterlog the soil. Feed with a liquid fertiliser every couple of weeks throughout active growth as this will encourage profuse blooming.